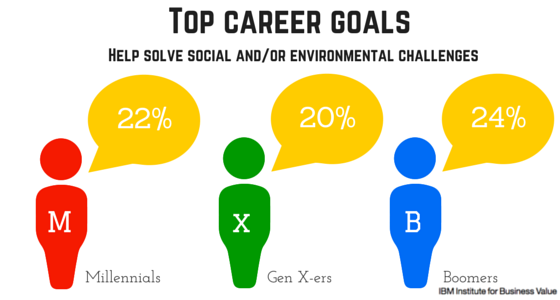 According to the bureau of labor statistics, Millennials will be the largest generation in the workforce in 2015. Companies are scrambling to adapt business practices and culture as quickly as they can to accommodate them and marketers are scrambling just as fast to court them. So with all the buzz orbiting around Millennials, I was a bit surprised at the engagement around this article “Why Middle-Aged Entrepreneurs Will Be Critical to the Next Trillion-Dollar Business” when I posted it a couple of weeks back. In a follow-up project, the backgrounds of 549 successful entrepreneurs were studied in 12 high-growth industries. The average and median age of male founders in this group was 40, and a significant proportion were older than 50. Soon after I found that post, I was tipped off to this study by IBM’s Institute for Business Value on IBM’s blog by Judy Gombita. While the two pieces of content vary on topic, I was picking up an underlying theme: Millennials undoubtedly have a unique differentiator of growing up as digital natives, but that doesn’t mean Gen X-ers and Boomers will be, or should be, packing their digital boxes and hitting the highway anytime soon. My take away: all skill-sets and professional experience will be as needed, and necessary, in the future as they are today. But — don’t let changes in technology or tools today be a non-success factor in your current company or hold you back from pursuing dreams and building your own business tomorrow. Over the next weeks we’ll be working in various topics and guests to talk about the mindsets and skillsets entrepreneurs and intrapreneurs need to succeed in the workplace. To kick off this week on #BizHeroes we’re excited to have Kalynn Amadio, a Small Business Marketer passionate about helping Boomers flourish in this ever changing market, as our Tweet Guest. We’ll be talking about The Benefits of Social Media to Your Business but with a bonus Boomer focus. If you haven’t yet met Kalynn, head on over to her business website iKalynn.com, and connect with her personal blog, KalynnAmadio.com. Then check out her podcast for entrepreneurs and business owners on ACTLocalMarketing.com. She’s a talented marketer, and we look forward to connecting you with her! Join us at 2pm ET on Twitter at #BizHereos to discuss. You can find the questions here. So what will success in the workplace look like tomorrow? Do you need a millennial mindset or simply an open mind? It might be yes to both and both might be one in the same. Kelly's a Digital Operations Specialist and Social Brand Strategist. She helps Startups and SMBs build lean marketing operations leveraging Social Media to support business goals and connect with the people who matter most. As former Head of Community and Communications for Paper.li, she was responsible for building community-centric operations to support Paper.li's rapidly growing user-base and founding #BizHeroes, Paper.li's Brand Twitter Chat that takes place Tuesdays at 2pm ET.